This research shows human beings prefer to look at painted portraits more than photographs. Today’s portrait artists should always be supported and encouraged. Our own Phil Boatwright brought this article to our attention. He said that Rembrandt’s technique had baffled him since childhood. Now explained in technical detail for all to savor… Boatwright is content. There may be some similarities in Rembrandt’s and Boatwright’s work! Contact us for his portfolio of commissioned portraits. This research done by iVizLab, which concentrates on expression based intelligent visuals and visualization lab research. The iVizLab is directed by Assoc. Professor Steve DiPaola and is located in the School of Interactive Art and Technology and the Cognitive Science Program at Simon Fraser University. (Canada) Steve DiPaola lead these experiments and recorded results in conjunction with James Enns and Caitlin Riebe. Below are their findings. Using new visual computer modelling techniques, iVizLab shows that artists use vision based techniques (lost and found edges, center of focus techniques) to guide the eye path of the viewer through their paintings in significant ways. These methods are known but have rarely been proven; even so, they typically are considered modern painting techniques. We have research that hypothesizes that Rembrandt, reacting to his Italian contemporaries, may have been the first to fully develop these specific painterly techniques, ones that are typically not associated with the early modern period – that engage the viewer and direct their gaze. Did artists like Rembrandt intuit a certain understanding of vision science (central visioning) that scientists only fully understood centuries later? New data from scientific eye tracking studies appear to show how Rembrandt’s late portraits exhibit strong use of vision based techniques. This approach to testing the texture-gaze hypothesis involved generating portraits that were plausible works of art, and yet portraits in which the textural level of detail was uncorrelated with the other levels of analysis (i.e., content, lighting, spatial layout). This was done through a three-step process. Researchers first photographed human models posing, dressed, and lit in a similar way to four of Rembrandt’s most famous late portraits. Second, they rendered these photographs in the style of Rembrandt using iVizLab’s knowledge-based computer model painterly rendering system where approximately 50 parameters of brush details, color palette and other painterly attributes were matched as close as possible to the original Rembrandt portraits. Third, they selected four regions in each rendered portrait for selective manipulation with regard to textural detail: one region centered about each eye and one region centered on each side of the chin, where the material of the collar meets the skin of the neck. A painted portrait is the product of a dynamic relationship between a sitter, an artist, and a viewer. The finished portrait can therefore be read as a narrative at several levels, including one of the intended self-presentation of the sitter, through their choice of posture, facial expression, and costume. It is also a narrative about what the artist has chosen to emphasize, through a selection of painting style, color palette, and level of detail in the portrait. Finally, each portrait tells a narrative about how the sitter and artist have chosen to communicate with viewers, who will look at the portrait with the intent of reading both the character of the sitter and the character of the artist in presenting the sitter to an audience. Portraits were rendered with a parameterized, non-photorealistic technique to mimic Rembrandt (DiPaola, 2007). Participants first viewed and then assigned artistic ratings to each portrait. Results showed that viewers’ gaze was attracted and held longer by regions of relatively finer detail and that artistic ratings increased when portraits strongly biased gaze. These findings imply that successful portrait artists rely on an implicit understanding of how gaze is directed by relative detail. Images were shown to participants where we use an eye tracking system in the UBC Vision Lab to record their gaze patterns. The Images consisted of 20 portraits specifically designed to test the detail-gaze hypothesis along with 20 filler portraits. The 20 critical portraits included the 4 original photos, along with 4 non-photorealistic computer-generated portraits based on each photo. These four portraits were created by varying the relative detail in the two eye regions, together with independent variation in the relative detail of the two collar regions below each eye. Rembrandt-renderings lead to a calmer eye in the viewer compared to the similar photographs. An eye with greater detail attracts a first fixation in less time, for a longer duration, and attracts more repeat fixations. Which Rembrandt used to guide your eye and create a narrative? They varied these details in the experiments to record the phenomenon. The ‘lost and found edges’ that was used in the cheek chin area, magnified the sharp eye phenomenon – another guiding technique. Artistic merit ratings during the second viewing of each portrait are predicted by looking patterns in the first view. The more an artist guides your eye (compared to even detail like in a photograph) the more you preferred the painting from an artistic sense. Forced-Choice Preferences between all four Rembrandt variants, show bias for pro-Rembrandt renderings. 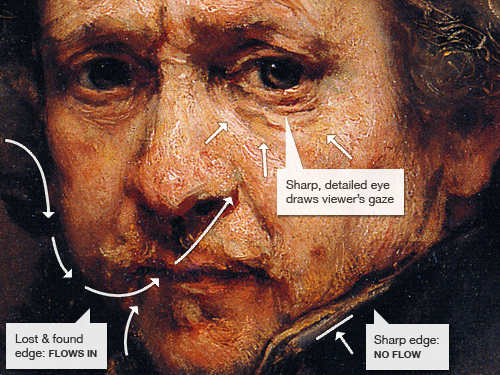 The way Rembrandt choose to guide your eye was preferred over our 3 other eye/chin variants. Today’s portrait artists provide visuals of our loved ones we prefer. Like it or not. Commission a portrait today! Click on ‘Contact Us’ for educated and professional help in selecting the right portrait artist for you. Posted on February 6, 2013 . Posted in Uncategorized. Bookmark this article. Copyright © 2013 Portrait Associates. All rights reserved.